'']] Bildhausen (Maria Bildhausen), a former Cistercian monastery, five miles (eight km) northeast of Münnerstadt in Lower Franconia, [[Germany|Germany]], was in the 19th century the seat of a Mennonite congregation, whose members had come from [[Baden (Germany)|Baden]] and [[Württemberg (Germany)|Württemberg]]. The first Mennonites settled in the region in the last quarter of the 18th century, where the [[Anabaptism|Anabaptists]] had in the 16th century had a large following. Peter Neuschwanger was named as the first settler; he arrived in 1770. Other families soon followed. 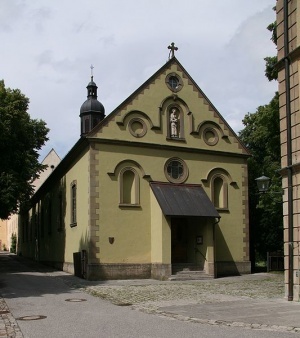 Services were at first held at various places, and were later transferred to Bildhausen and the adjacent monastery. Hege, Christian. "Bildhausen (Münnerstadt, Freistaat Bayern, Germany)." Global Anabaptist Mennonite Encyclopedia Online. 1953. Web. 22 Apr 2019. http://gameo.org/index.php?title=Bildhausen_(M%C3%BCnnerstadt,_Freistaat_Bayern,_Germany)&oldid=91125. Hege, Christian. (1953). Bildhausen (Münnerstadt, Freistaat Bayern, Germany). Global Anabaptist Mennonite Encyclopedia Online. Retrieved 22 April 2019, from http://gameo.org/index.php?title=Bildhausen_(M%C3%BCnnerstadt,_Freistaat_Bayern,_Germany)&oldid=91125.